Four Star can help you buy a home that is perfect for you. Find Your Perfect Home in Florida! We are the largest mobile and manufactured home sales company in Florida. We have homes available in active adult communities as well as 55 plus communities that provide resort style living. Live in sunny Florida. Hundreds of homes to choose from priced as low as $7,000. Single-wides, double-wides, triple-wides, foreclosures, distress sales. Brand new models or pre-loved homes... in a park or on your own land. Just minutes or a short distance to the beach and attractions... you choose! Lovely communities with pools, clubhouses, tennis and more. From the active to the leisurely, we have the lifestyle you are looking for. Check out our featured listings. 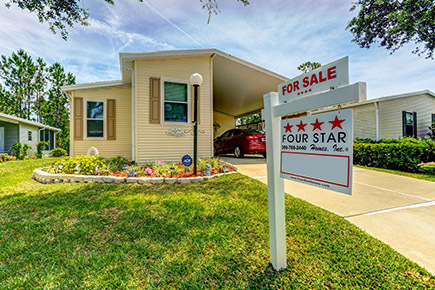 Four Star can help you find a home that is perfect for your needs. Are you retired or nearing retirement age? You've worked hard your whole life - isn't it time you enjoyed the fruits of your labor? Adult communities are very popular for socially and physically active seniors. They have a variety of activities available for your kind of lifestyle. Whether you enjoy fishing, boating, golf or just walking along our beautiful beaches, Florida can be the perfect home for retirees.